There’s a lot of speculative fiction that wonders what would happen if humanity ever colonized space. The chances of our species actually managing to set up living communities on other planets are, for the time being at least, ridiculously remote, so it’s ripe territory for sci-fi. What would a Mars colony look like? What would it actually be like to live on the Moon? Some of the best sci-fi novels, like Frank Herbert’s Dune and Edgar Rice Burroughs’ John Carter series, ask these very questions. In reality, space is a pretty hostile place. If you’re not choking on the lack of oxygen or being sucked into a black hole never to be seen again, you’re being blindsided by an errant asteroid or simply drifting off into the vastness. Space probably isn’t a very nice place to actually be, which is why we’ve got video games, books and other stories to fill the void (no pun intended). If Crossy Road and its new Space update are to be believed, we’re better off sending chickens to do our space exploration for us. Ensconced firmly in its exclusive home on the web Poki, Crossy Road has just had a whole bunch of new stuff dropped on it in the form of an all-new Space level and several extra characters to go along with it. As such, we thought we’d re-examine the case for Australian studio Hipster Whale’s magnum opus and tell everyone why they really should be playing this game. Moving Crossy Road to a space setting turns out to work extremely well. Instead of the game’s usual cars racing across roads at breakneck speeds, we have giant asteroids careering across conveniently-arranged gaps. The asteroids make for a far more engaging hazard to avoid in our books, because we’ve often dreamed of being space explorers dodging asteroid fields with nothing but our wits to carry us through. Similarly, many of the game’s usual stationary objects have been replaced with astronomy-themed alternatives, such as robotic guardians, coasting metal bars and other space-related debris. For our money, the Space update breathes new life into Crossy Road, which was already a game on hard rotation here. If you’re not a fan of space, or it makes you queasy, Poki makes it ridiculously easy to switch worlds. All you need to do is click the button to the right of the game window and voila, you’re playing the other version of the game. Other than the aesthetic and presentation updates, Crossy Road Space is still largely the same wonderful game it always has been. Navigation is done with the keyboard keys on the web edition, which makes the game effortlessly intuitive and fun to control. You can also use the space bar or the mouse to hop forward, but as far as we’re concerned the keyboard is the only real way to control the game. There will be times when you’ll need to move backwards or sideways quickly and without fuss to collect coins or get yourself out of a tough spot, and the keyboard is the easiest way to do that. Otherwise, it’s still very much Crossy Road, or Frogger with chickens. If you’ve never played the classic arcade game Frogger, it was essentially a game in which you took control of a frog and crossed roads, rivers and other dangerous hazards in order to reach the end of the stage. There were several other hazards to avoid besides geography, including alligators and other dangers. 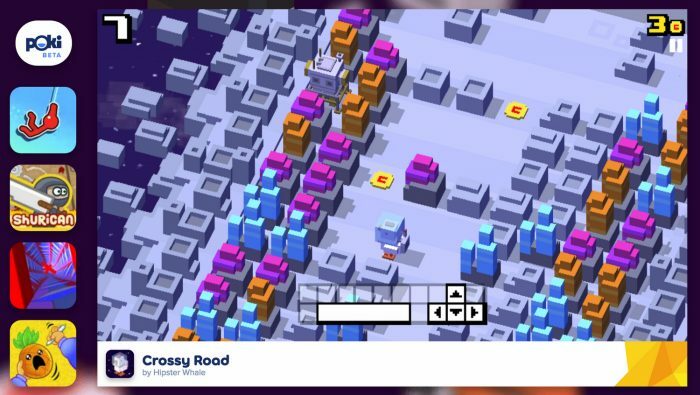 Crossy Road simplifies and streamlines the formula, making the game simply about dodging rather than introducing live hazards for the player to combat. What you’re left with is a game that emphasizes player skill and speed, as well as rewarding good forward planning. Crossy Road scatters its collectible coins across the level in interesting places, forcing players to move off the beaten path to collect them and thus jeopardize their chances of victory. The bottom of the screen moves inexorably towards the player in Crossy Road, and if you get stuck between a tree and the screen then it’s curtains for you and your chicken. As such, ducking away from your path to grab an errant coin can sometimes mean the difference between life and death. The fun in Crossy Road doesn’t just come from cutting an effortless swathe from danger to danger. It’s also in managing to swipe that coin and duck back around the obstacle to smoothly resume the path you were originally taking. Demonstrating skill in Crossy Road might seem like a pointless exercise – it’s only you watching, after all, unless you’ve got an audience – but the truth is that this game is so perfectly balanced that doing well will never make you feel anything less than outstanding. When you do eventually fail, and fail you will, you’ll simply pick yourself up and try again thanks to the game’s lightning-quick restart mechanism. 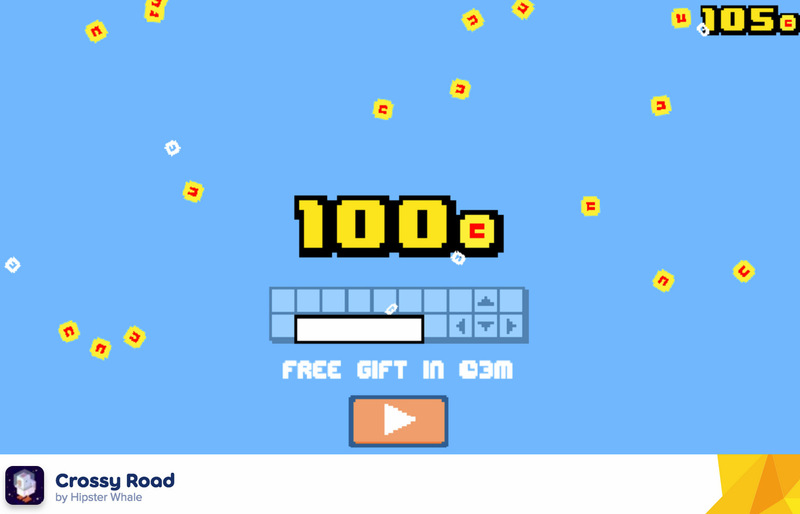 Once you collect 100 coins in Crossy Road, you’ll be prompted to unlock a new character using the game’s Japanese gatcha-style machine complete with little capsules. The Space update adds new intrepid space explorers to dodge asteroids with, including an astronaut, a space dog and a sentient piece of moon rock (best if you don’t ask questions). These new characters are, of course, nothing more than aesthetic, but in true Hipster Whale tradition they do add some new sounds and cute little interactions to watch out for. Each new character extends the longevity of the game simply by adding some more eye candy to an already-beautiful game. Crossy Road was already excellent, a masterpiece of simplified game design, and the Space update simply adds a fresh coat of paint to an already tried and tested formula. 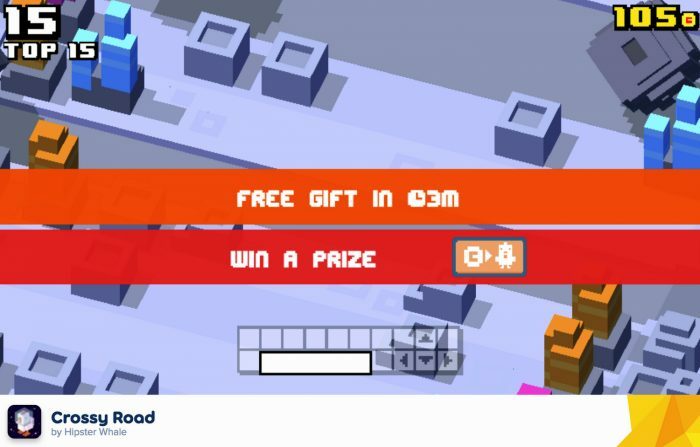 If you love the original Crossy Road but you need to get some more mileage out of it then the Space update should provide you with the perfect excuse. If you’ve never tried the game before, what are you waiting for? Go dodge some asteroids!